Fault Injection Attacks (FIAs) have become a critical threat towards prevailing security embedded systems. FIA typically exploits the maliciously induced faults in security ICs for retrieving confidential internals. Since the faults are injected by disturbing circuit behaviors, FIA can possibly be detected in advance by integrating a sensitive sensor. In this paper, a full-digital detection logic against laser fault injection is proposed, which mainly consists of a high-frequency RO watchdog and a disturbance capture for sensing frequency ripples due to laser impact. 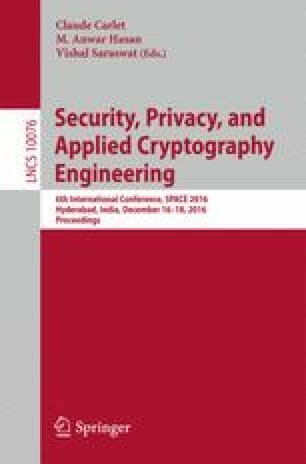 Practical experiments on Virtex-5 FPGA show that the proposed sensor has fault detection rate of \(100\,\%\) for both regional and single CLB injection, protecting critical registers of PRESENT-80 cipher, with superior power/spatial security margin compared to a prior PLL-based sensor, while maintaining extremely low cost in hardware. The proposed logic is further applied to protect complete cipher over larger fabric, and the fine-grained fault injection using pulse laser shows a detection rate of \(94.20\,\%\), and an alarm rate of 2.63 : 1 in this experiment. Owing to its simple digital architecture, this system can be easily applied into any security-critical ICs.